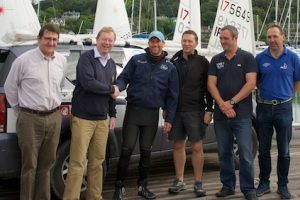 A sailor from Dublin by the name of Gary Sargent, is currently sailing single-handedly around Ireland in a laser dinghy. 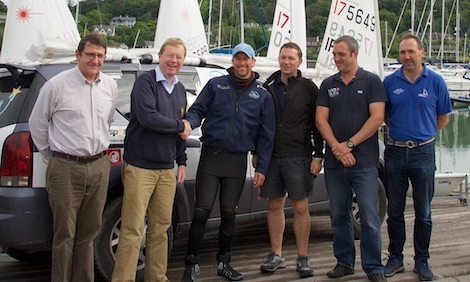 Having started from Schull a number of weeks ago, Gary left Ballycotton yesterday morning and arrived in Crosshaven early afternoon where he was welcomed by our own senior club laser sailors Eddie Rice and Nick Walsh. Gary’s key objective for completing this circumnavigation is to raise funds for Childvision which is the only place in Ireland dedicated to the education and therapy needs of blind children. Pictured above , our Admiral John Roche was on hand this morning to bid farewell to Gary on the next leg of his journey and we wish him every success. 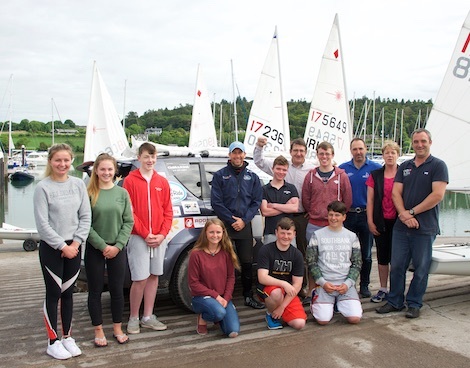 In addition many of our junior laser sailors and their class captain Annamarie Fegan (pictured below) were also present to show support ahead of Gary going on the water to continue his journey. O’Leary wins 1720 European Championship.